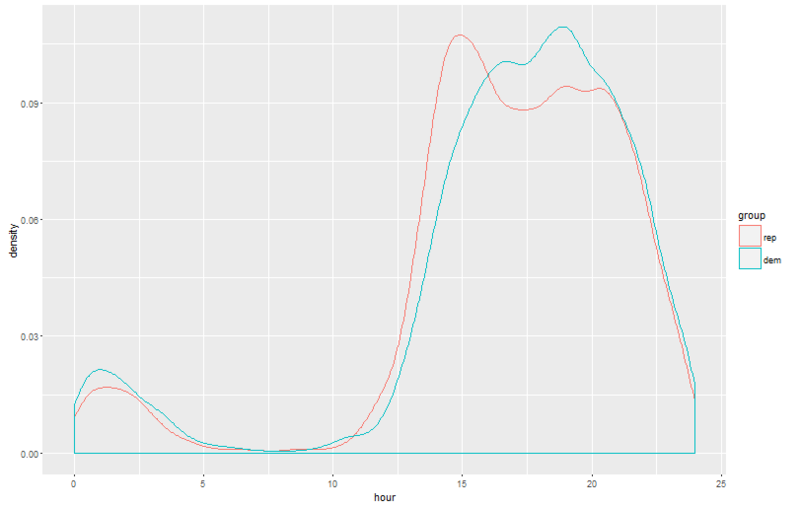 For my first blog post on R, I want to show how to use R to mine Twitter-data. I wanted to write this guide for several reasons. First, while there are many other guides on R-Bloggers that show similar things, they tend to focus more on setting up your Twitter account and using wordclouds. As researchers however, we are often also interested in comparing and contrasting data between groups. Meta-data can be a rich source of information for that. This approach also means that the scripts we want to write have to be more reusable in nature in order to retrieve, load, and analyze several different groups repeatedly. To this end, I will provide some simple functions built on top of other packages that enable you to download tweets from pre-specified groups of people instead of just whoever tweets on a certain topic. Lastly, I wanted to show how analysing the Twitter meta-data in addition to the tweets themselves can lead to better behavioural insights. This guide requires that you have a Twitter account, R(studio), and have setup a twitter-dev account with OAuth. I’ll leave the details of how to get OAuth and dev-app running here, since it explains it better than I would have been able to. before running the code above. To get a feel for the commands we will pass through the code, I urge you to have a look at Twitter’s API documentation. To get warmed up, let’s see what the two US presidential nominees have been talking about. function from the twitteR package. # n specifies how many tweets you want from the user. We will use 200 in this example, but the maximum is 3200. Unfortunately you can't use the API to request tweets older than a week or two at most. This is a restriction of the Twitter Search API, and it often means you won't actually get the number of tweets you specified. Making a function like this is not strictly necessary, and if you want to do serious text mining (or sentiment analysis, then it is advisable to save a separate TDM for later use. For now though, having a function makes repeating the same code over and over again a little easier. The function takes two extra arguments. StemDoc asks if you want to stem the text, making the computer try to make words that are similar appear as the same. So “great” and “greater” gets treated as the same identity. rmStopwords simply removes words that are often used but don’t add any additional meaning. I have defaulted them to true in this example for both, but you can experiment with switching these on and off to see how it affects your results. # Selects the 15 most used words. # Create bar graph with appropriate colours and use coord_flip() to help the labels look nicer. # There are other ways to get these plots side-by-side, but this is easy. But that’s only for two Twitter-accounts. What if we wanted to look at a selected sample or a section of a population? If you are just interested in massive, massive amounts of data, then Twitter lets you sample 1% of their tweets using a specified function. This is relatively noisy though and if you don’t know what you are looking for, then you aren’t likely to find anything either. There are other guides that show you how to do this, but I want to show instead how we can use twitter-lists to mine data from a pre-specified group/list of people instead. After you have created your list you can simply download all the latest tweets from them using a simple for loop. # Download tweets from a group of people specified in a Twitter list. ## add it to the return statement at the bottom (use a list). ## Useful if you need to verify identity of people. ## Loops over list of users, use rbind() to add them to list. ## Sleeptime ticks inbetween to avoid rate limit. # If a Twitter-user has no tweets, userTimeline and rbind fails. The if-else statement solves this. Twitter-lists are lists of Twitter members that users create on Twitter in order to filter their home feed and only recieve tweets from those members. These lists are useful for data-mining since they allow us to put people in different quasi-experimental groups that we can then compare afterwards. So all you need to do is to create separate lists of the groups of people you want to extract tweets from. If you don’t have your own lists (they are easy to make), then you can also just use someone elses list. Simply supply the function with the list owner, as well as the name of the list. To continue our investigation into the political world, let’s compare tweets from Democrat and Republican House Representatives. Note that both of these commands will take some time as there will be a lot of tweets downloaded. To get an idea for how many tweets, use this formula: (number of list members * 7 sec)/60sec. There’s 261 Republicans in our list, so that means it will take a minumum of 31 minutes to download all the tweets. If you want it to go faster you can adjust the sleepTime parameter. Note however that if you set it below 5, then the Twitter API will start throttling you. Go grab a drink instead. After that is done it is strongly advised that you save the contents to your hard drive (so you won’t have to download them all at once again). Use write.csv(nameOfFile, "nameOfCSV.csv") to save it in your working directory. All done? Excellent, now we have a lot of data to work with. Let’s re-run the previous analysis and plot the graphs I have ommited the plotting code as it is identical to the one used above. That is certainly interesting. Turns out the House actually seems to care about the same things! Being up for re-election so much of the time seems to have a rather humbling effect. 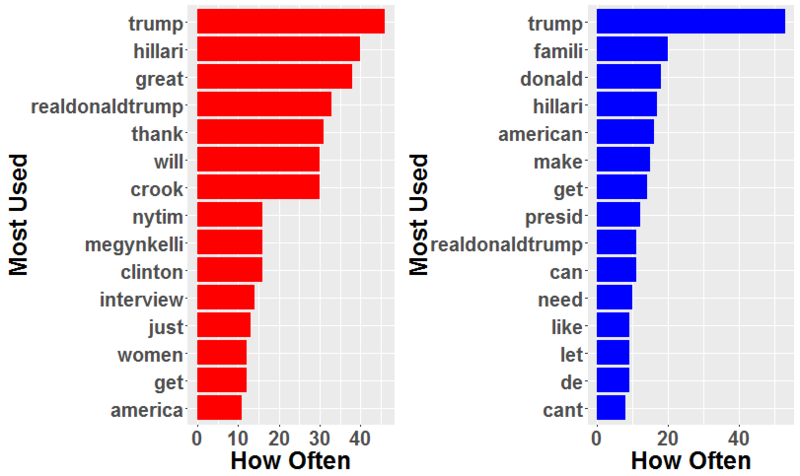 Using meta-data to dig even deeper. Do politicians have different tweeting strategies? Do they for example tweet at different times of day to target their preferred audience? Do they all carefully schedule their tweets, or can they be more impulsive (dependent on party)? # Use the lubridate package to make working with time easier. #this last re-factoring just makes the colors in the plot correct. For your own groups you want to remove the line of code underneath. Republicans have their peak almost always at 15:00 every single day. I am not American myself so I don’t know the political system well enough, but that does seem like something a little too odd to just be a coincidence. Feel free to come with suggestions in the comments. On a more humourous note, the late-night bump for the democrats are even more pronounced during the weekend. 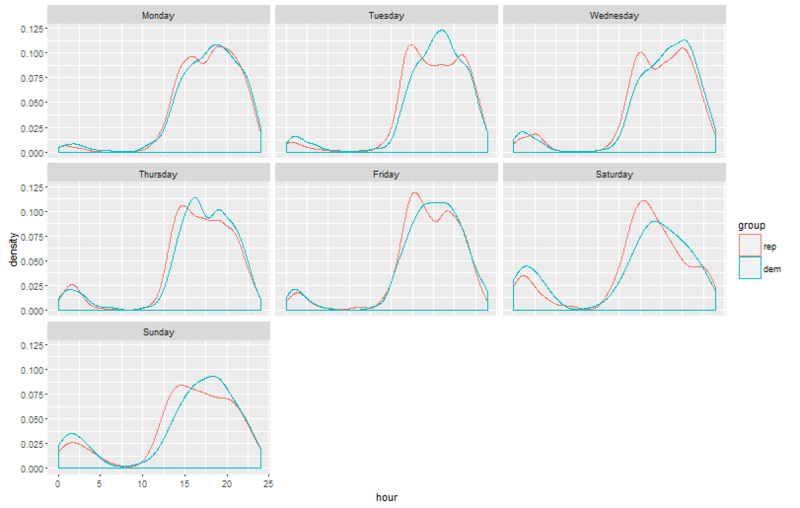 Who schedules the most and who tweets more on the fly? That’s some pretty big differences there between Trump and Hillary especially. Whereas Hillary seems to use Tweetdeck the most (probably to schedule tweets), Trump seems to live and die by his two phones.This is consistent with his impulsive image. Republicans and Democrats are more similar, especially in how no-one uses Android phones. Looks like if you’re an American representative, then you better use American products. 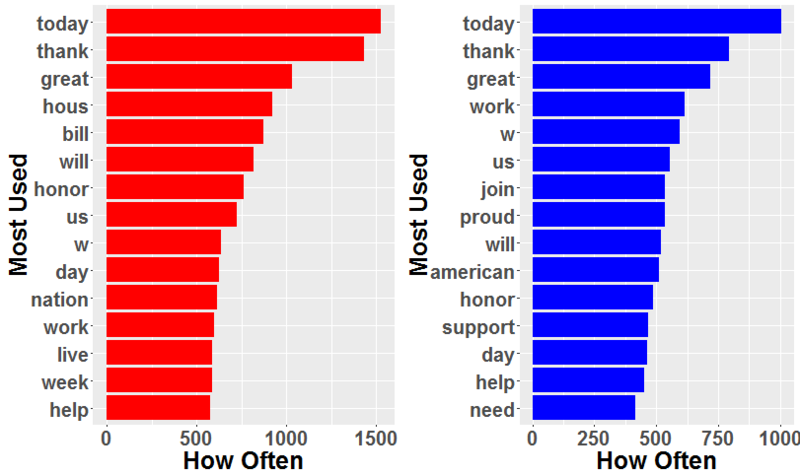 But note how Republicans seem to use scheduling services (TweetDeck and Hootsuite) more often. This could potentially explain the 15:00 bump that we found previously. A more thorough investigation could look at what type of platforms were most used around that time of day, but this article is already getting quite long. So I am going to stop here, and I hope you will play around with the code yourself to see what you can find. In the future I am hoping to make a post on combining different sorts of meta-data using the dplyr package to answer even more fine-grained questions. If you have any questions, or something isn’t working as it should, please feel free to contact me @andreasose.